I want to give the biggest thanks possible to all of those who have been involved in and who have contributed to this project from its inception. The efforts and energies of many have gone into this project from its beginning and through its various reincarnations. Inevitably, when this is done, there is always the risk of leaving someone out. If I have done so, let me know. To begin with, in 1999, Dr Yo Yuasa and Dr S. K. Noordeen hatched the idea for an International Leprosy Association’s Global Project on the History of Leprosy (ILAGPHL). This challenge was taken up by Paul Sommerfeld and advised by Michel Lechat, Bernardino Fantini, Mark Harrison, Anwei Law, Julia Sheppard, and Colin McDougall. The idea was to make sure that the work done against the disease would not be forgotten. They decided that one way of doing this was to embark on an archival project – one of preserving the history of leprosy. Sadly, Dr Colin McDougall and Emeritus Professor, Baron Michel Lechat are no longer with us. I was appointed to the project at the end of 2001, the ILAGPHL found a home for itself at the Wellcome Unit for the History of Medicine, at Oxford University, and Paul Sommerfeld helped transition me into the job, and relinquished the reins, moving on to work against other diseases. My biggest thank-you in those times goes to Debbie Emmitt who applied her skills in French and Portuguese together with her wonderful editing skills and her growing expertise in web editing and database management to the reinvented project. Later in the project, Huw Price took over as contribution to the database and editor extraordinary. A big thank-you to John Manton for welcoming me into a club of two people working on leprosy in Oxford and a good friend for the journey. The brilliant IT team at Oxford University Computing Service (OUCS), Wylie Horn, Jon Hutchings, and Ian Atkin designed a database with a web interface, a bit of a novelty in 2001. Dave Miles was our maestro of databases – producing input forms that were sheer poetry to use. Then there were all the contributors to the content in the database. The people who so willingly permitted us to list their personal collections and the archivists and librarians who happily allowed us to list the leprosy-related resources in their repositories. A big thank-you to Jane Buckingham and Dorothy McMenamin in the Pacific, to Anglea Leung and her researchers in China, to Jose. L. Barona and his researchers, and Kirsten Milnes in Spain, and Jorge Varanda Ferreira in Portugal, to Emilio Quevedo, and Diana Obregón Torres and her students in Colombia, Biswamoy Pati, Chandi Nanda, Saurabh Mishra, and Suchita Patel in India, Sloan Mahone in Kenya and Uganda, Mesele Terecha Kebede in Ethiopia, Loh Kah Seng and Ann Lee in Malaysia and Singapore, Ken Kalling in Estonia, and Dr Revankar at the Rockerfeller Archives in the US, for the work that you all undertook on behalf of the project. Then an overwhelming thanks to all of those people who so willingly taught me about leprosy and to all of those who contributed to our research. My first encounter with leprosy outside Australia was in India, in 2001, at the Adams Wylie hospital in Bombay. The old bungalow had been built in 1902 when plague had flared up in the city. There I met Dr Hari Bulchand, who was working for Bombay Leprosy Project (BLP) under the authority of Dr R. Ganapati, Dr C. R. Revankar, and Mr Pai. BLP had taken over the Adams Wylie Hospital in 1979 to look after people with leprosy who were in need of hospital care. He told me about the chemotherapy and introduced me to some of the patients, and then, fired by my obvious enthusiasm, took it upon himself to take me on a three-day tour of Bombay, undeterred by increasingly bemused phone calls from BLP. Thank you, thank you for the adventure, Dr Hari. 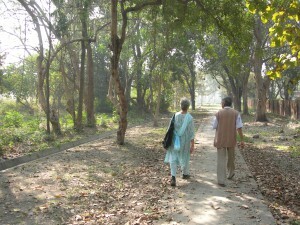 Shubha Pandya and the Director of the Leprosy Mission, Faizabad. On that same trip, I met the only other woman in the world, it seemed at the time to both of us, who was studying something about the history of leprosy (although we did wonder what University Jane Buckingham was based at – this was before her book – did Canterbury mean the UK or perhaps it was NZ?) Shubhada S. Pandya had already had one perfectly valid career. She had been a neurophysiologist, but she was also the trusted historian of leprosy in India. Everyone in Bombay had been saying: “Oh, history of leprosy, have you met Shubha Pandya?” It turned out that we were destined to fly to Wardha, in central India, to visit Gandhi’s ashram in Sevagram, to go to Orissa with Mr Jayadev Sahu, to go to the old Leprosy Mission asylums from Purulia, down the Coromandel Coast to Salur, Vadthorasalur, and then again, north to Faizabad. Thank you to Jayadev Sahu who accompanied us around the old leprosy places of Orissa. And to Chandi Prasad Nanda for all of his assistance in Orissa. At one stage I was fortunate enough to be able to stay at the Gandhi Memorial Leprosy Foundation (GMLF), in Wardha, breathing in the atmosphere of that extraordinary place. The people there opened their record room and began the process of recording its contents and putting into place strategies to keep their archives safe from the heat and the dust. Mr Prabakar Rao uncovered treasures from the early days of the organisation that told of the first organised indigenous efforts to provide treatment to people outside of leprosy asylums in India. At another time, I went with Dr S. K. Noordeen to the Central Leprosy Research Institute (CLTRI) at Chingleput in Tamil Nadu and dipped my toe into their library and made them turf out their record room. Thank you too to the Leprosy Mission India and to all of the superintendents who welcomed me as a guest throughout India. Thank you to Joyce Missing and June Nash at The Leprosy Mission International, in Brentford, London, with the most wonderful repository that spans the years of their organisation. My delighted thanks too to the Raoul Follereau Foundation (La Fondation Raoul Follereau) for welcoming me to their office in Paris, to M. Récipon (who is sadly no longer with us) and to Brigitte de Bellefon for all of her assistance. I also had the pleasure of being let loose in the Damien Foundation archives in Brussels and the ILEP archives. Thank you to everyone for this privilege. One of the highlights of my investigations began in Salvadore, Brazil, when Dr Artur Cunanan told me that there were “a lot of records on Culion” in the Philippines. Since then I have been to that extraordinary place several times, but the first time made me realise how Gollum felt. There before me were the rooms that Dr Wade had set up for his laboratory and office. There was the library where he had gathered together all of the key works on leprosy (some that are now unobtainable elsewhere). There were all of his files, his correspondence, and his reports. Everything as it was, just as if he had walked out. Thank you, Art and thank you to Ricky Punzalan, Mimi Santos, and Alexandra Botelho who, as volunteers, worked with Dr Cunanan to produce the Culion Museum and to preserve the Culion archives. Most of all thank you to the people of Culion who stand so proudly beside the photographs of their exhibit and tell of their experiences as people who were exiled to this remote island in the Palawan group because of leprosy. Another highlight was to go and stay with Irene Allen from LEPRA in Colchester and trawl through the BELRA records that she had salvaged from imminent destruction. Irene is another confirmed researcher caught up by this history who for a long time thought she was the only strange one in the world who found this interesting. Last but not least, my deep thanks go to both the Nippon Foundation and the Sasakawa Memorial Foundation for their passionate interest in this topic and their commitment to the people affected by the disease. Dr Yuasa, Mrs Yamaguchi, Nao Hoshino, Aya Tobiki, and everyone else who has walked this walk with me, making it possible with funding and interest. Dr Yuasa saw this project as his baby. His vision made it possible. Mrs Yamaguchi made the history of leprosy throughout the world her own subject. She has constantly sent me news of her discoveries, and she has told people about the project everywhere she has gone. Quick to see the contribution that this project could make in bringing the plight of people affected by the disease to public attention and to breaking down stigma and prejudice, she has searched out ways of foregrounding the preservation of this history. And a very quiet thank-you to Mr Yohei Sasakawa for believing in the history of leprosy and making it possible. A very special and most immediate thanks goes to Aya Tobiki who has pursued me relentlessly for the details necessary for reconstructing and reinventing this website and database in order to reinvigorate this project. And more than thank you to the magical designer and website developer Mr Ryo Mogi who is turning our old database and website into something that is fit for the future. My deepest thanks goes to Grace Nye, my “Debbie” in Australia, once again, smarter than me and a much better editor. Thank you to Grace that in such a short time she became fascinated with this history. Without her enthusiasm for updating the database in such a short time, I would have lost the will to live. Thank you to everyone who appreciates the value of what we are trying to do. And thank you for the flame of interest that you have kept alight.